These bird of paradise flowers are unique, exotic, colorful and just plain fun!! 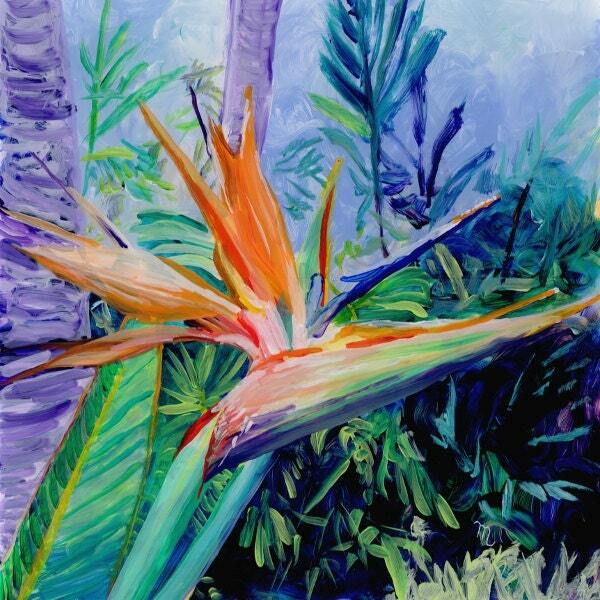 "Tropical Bird of Paradise" is an original acrylic painting on plexiglass measuring 12"x12" and painted in a "reverse" style which means the foreground is painted first and the background last. The painted side is actually on the back of the 1/8" plexiglass. Colors may vary slightly from monitor to monitor. This painting can be displayed on an easel as is, displayed in a window (the plexi will allow some light to shine through to create different effects), or it can be framed. I use only the finest quality art supplies in my acrylic paintings. Also, my art has been certified and accepted by the County of Kauai into their "Kauai Made" program which represents those products made on Kauai, by Kauai people. The painting comes with a signed "Certificate of Authenticity." The item will ship via USPS anywhere in the world and includes shipping insurance if available. The painting is shipped unframed.